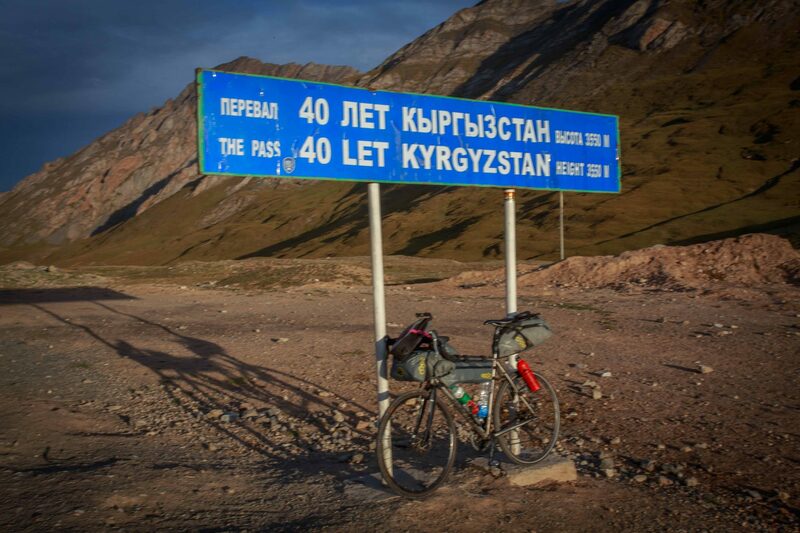 In 2014 while cycling to China, I was gutted to miss one of the most beautiful and intriguing parts of central Asia. 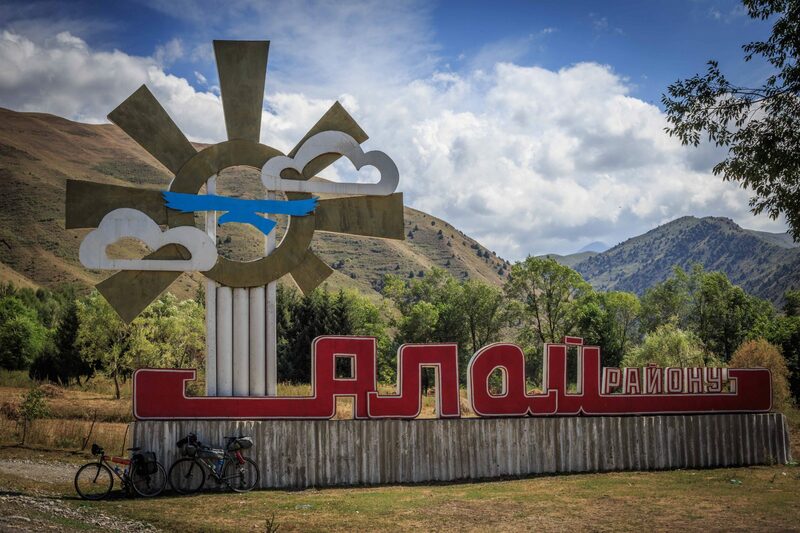 I didn’t take this route through a combination of trying to visit areas less frequented by tourists on the overlander route, combined with saving time waiting for an extra for Tajikistan visa, which would have meant staying in Baku for quite a while…. A a result I only met a handful of of other tourists over the entire trip to China, and being an unusual sight in bleaker parts of Kazakhstan I was greeted with much warmth and sincerity by so many locals, the trip became all about the people. While I liked taking a random path through a sometimes bleak Kazakhstan, there was a nagging feeling I had missed some spectacular scenery and truly unique mountain-scapes in Tajikistan, Afghanistan and Kyrgyzstan. Therefore I knew I would come back…..and I did less than 12 months later. 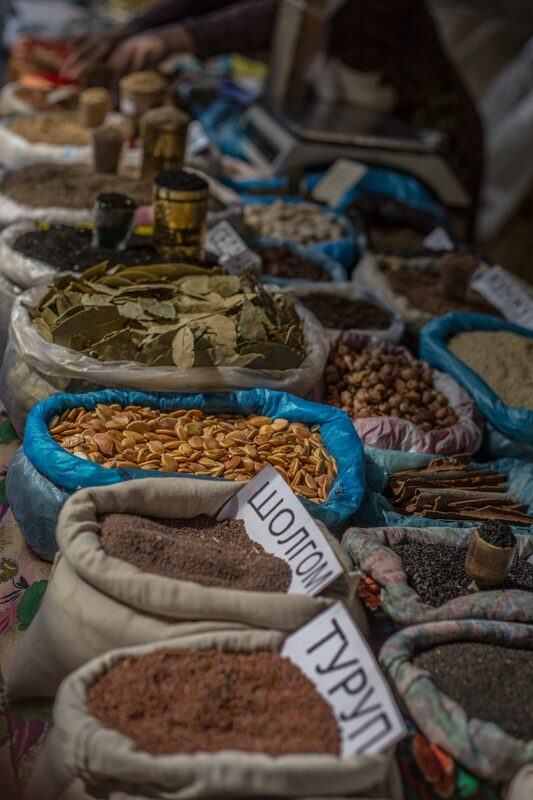 As we started our latest trip I felt a bit of a fraud when I arrived in Osh, Kygrzstan. Why? Because flying here with a bike feels like cheating, it’s taking the boring easy option. I might have cycled here last year but we were now on a relatively tight time constraint and luckily Osh airport has a handful of international flights making a shorter trip easily feasible. 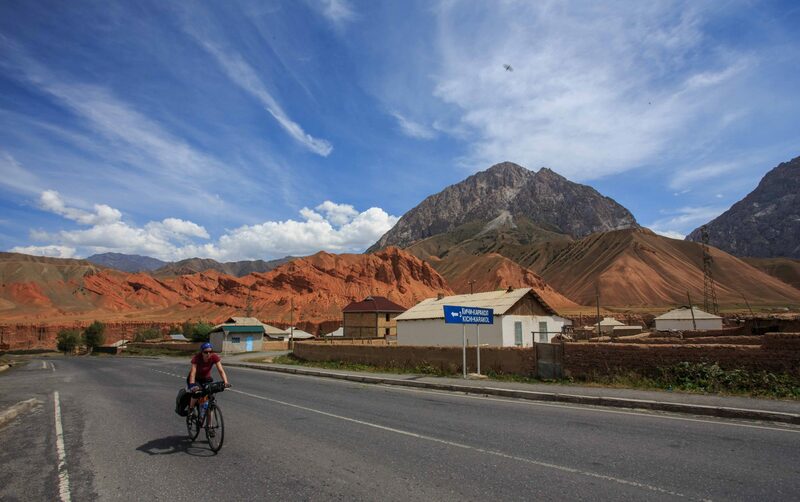 But don’t be fooled this part of Kyrgyzstan is still very much the domain of long-term overland adventure travelers, folks on pedal bikes, motor bikes, cars, 4×4’s and even French guys on donkeys, far less arrive by plane. 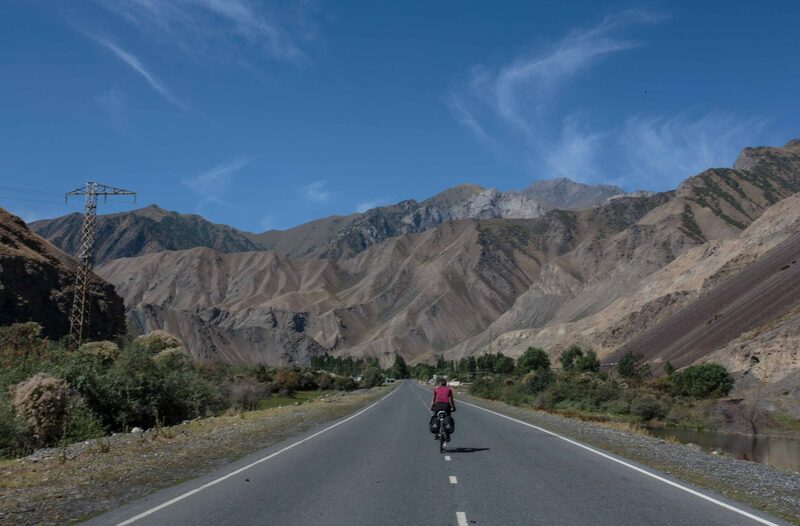 In fact it’s totally remarkable how many people are on epic overland travelling journeys these days, but we were here instead to cycle tour a wild remote loop high up in the Pamir mountains along the best bits of the Pamir Highway. We rolled out of the aeroplane at 4am into the warm night air, a stark contrast to the damp chill of Scotland in summer that we had left 11 hours earlier. It was clear despite the lack of lighting that Osh airport was very small and of a concrete utilitarian soviet style. We walked across the tarmac from the plane to passport control where a group of guards ordered two queues. The main green uniformed guard was letting a few locals skip the queue but finally we got to the front and received our entry stamps – No visa needed for Kyrgyzstan. The bikes finally turned up and two locals had even carried them over to us before we spotted them, cycle tourists still stand out in Osh. Next we had to get a taxi to our hostel and despite the ungodly hour a rush of offers was waiting behind the exit fence, so we sat around plucking up courage to leave the safety of the airport. We needn’t have worried, a short friendly guy offered us a good deal as soon as we left the gates. At this point we had also picked up a French girl who had arrived on her own and wanted the safety of a shared taxi. Little did she anticipate her shared taxi would involve contorting herself around two bike boxes in the boot of a Toyota estate car – rather less safe! I shared the front seat with Marion meaning a leg slap for each gear change the driver made. We were back to an environment where seat belts and safety laws are irrelevant, quickly noted as we sped the wrong way around a large statue on a traffic island, I thought I could smell alcoholic breath in the car too. It wasn’t too far to the hostel so we survived and our friendly driver had time to ask if the French girl wanted a husband and a few other unknown but certainly friendly requests too. 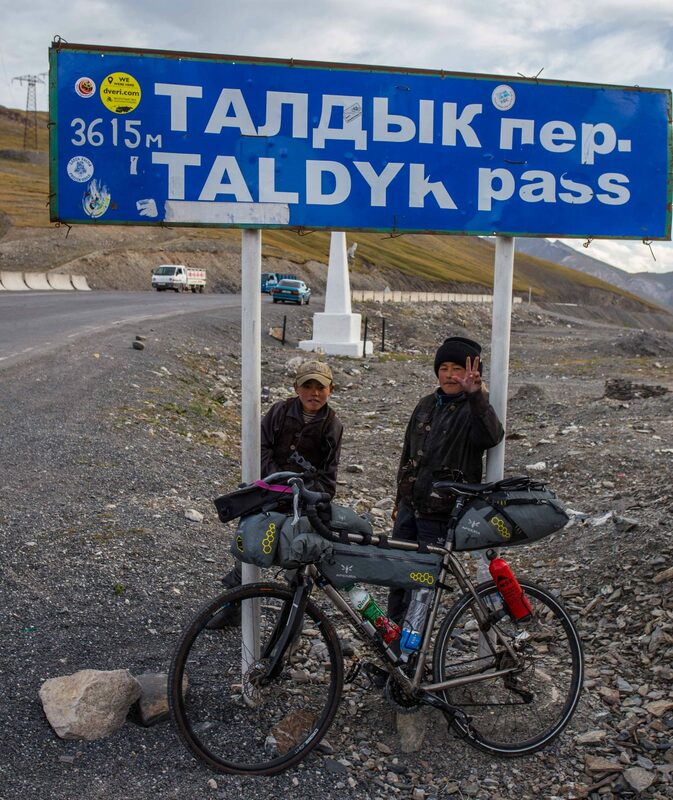 We decided to relax the next day and prepare the bikes as well as stocking up on food from Osh’s Bazaar, which is huge, like 4km huge. 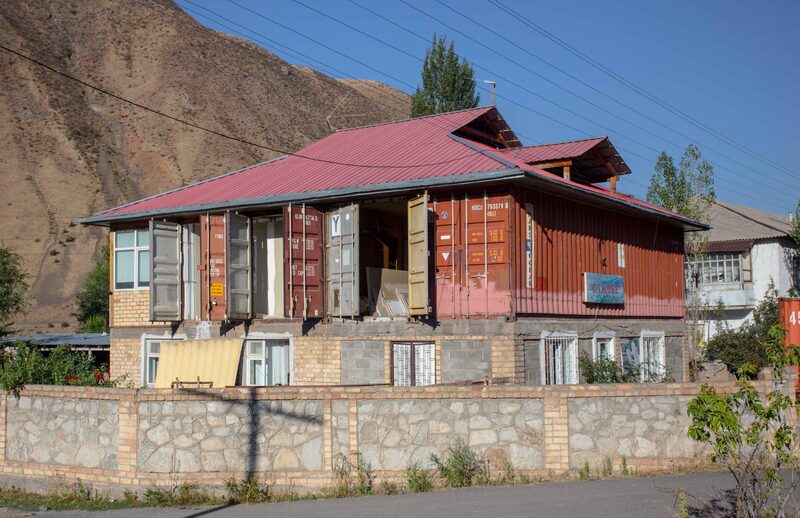 It’s stretched along the river and is a relic from the old silk road trading days. 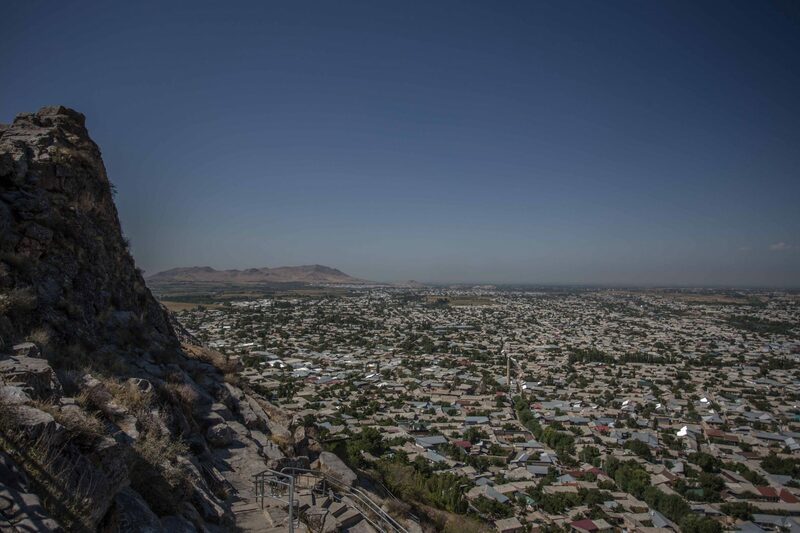 Osh as a city is older than Rome and has been a trading centre for 3000 years. It’s a sprawling mostly single storey city that disappears into a curtain of dust from the arid mountains at its perimeter. 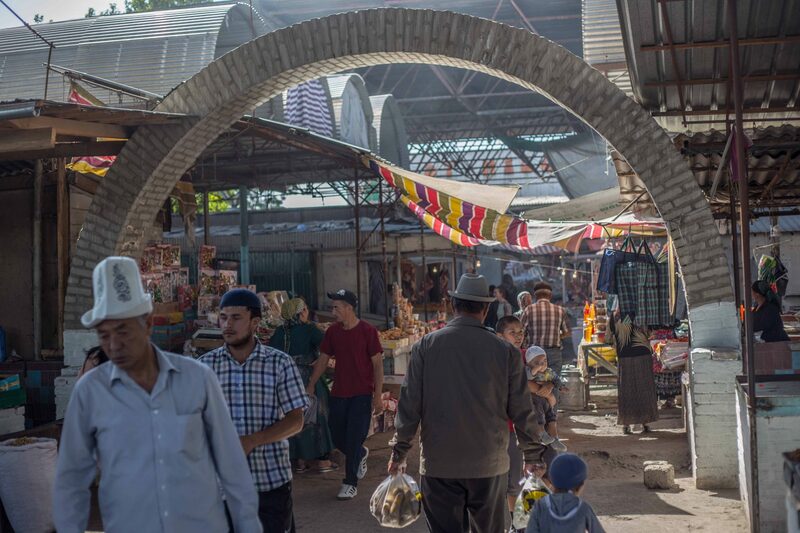 It sits at the head of the fertile Fergana valley and it’s unique location draws Kyrgyzs from the mountains, Tajiks from the Pamir, the Chinese from Kashgar, Uzbeks from the cotton rich plains and more ethnicities from further afield all wanting to trade at Osh over the past centuries and still today. While the Bazaar is now heavy on Chinese mass production it’s still a place you can wander all day just seeing different sights at every turn. The highlights were ornate baby cribs to vast piles of fresh veg and literally tons of melons. 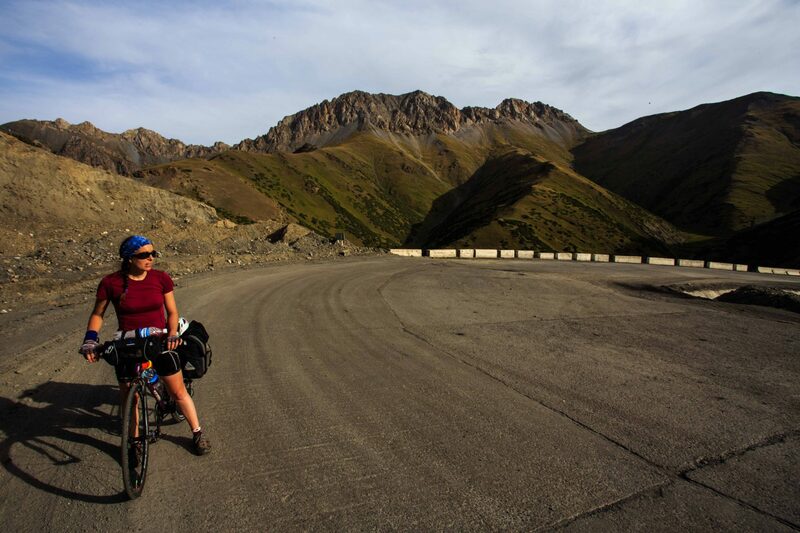 With full bags and tuned up bikes we set our alarms and pedalled off early the next morning. 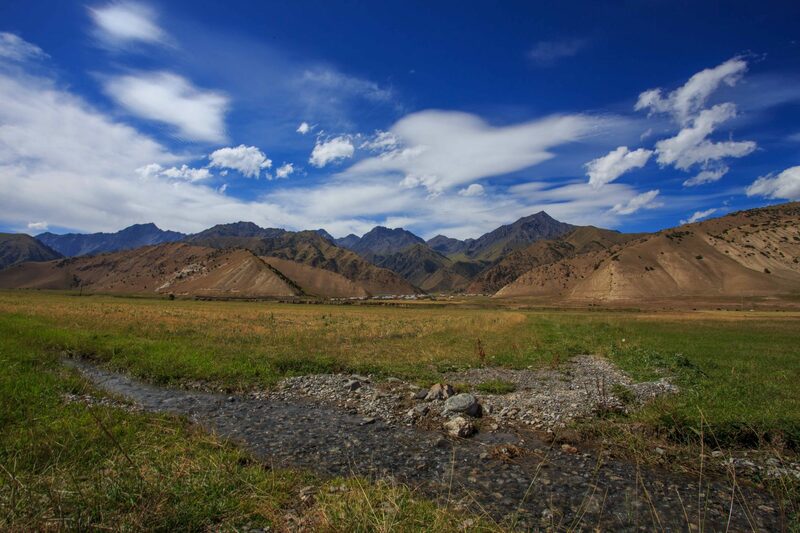 We were headed for Gulcha, a small town 90km out of Osh on the M41 AKA the Pamir Highway. 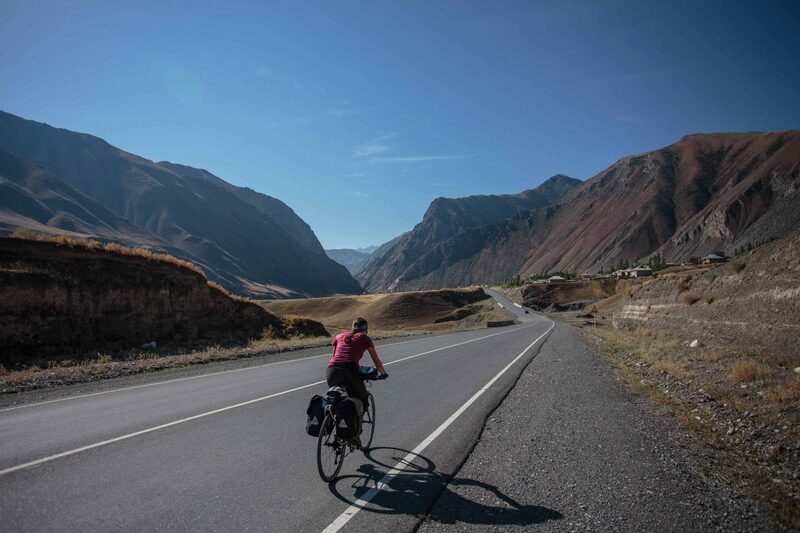 The intensity of contrast from Peebles in Scotland to Osh had been a shock, after no time for cultural acclimatisation, dust, dirt, and the stifling heat were all pretty intense and getting back on the familiar territory of bikes was a relief. 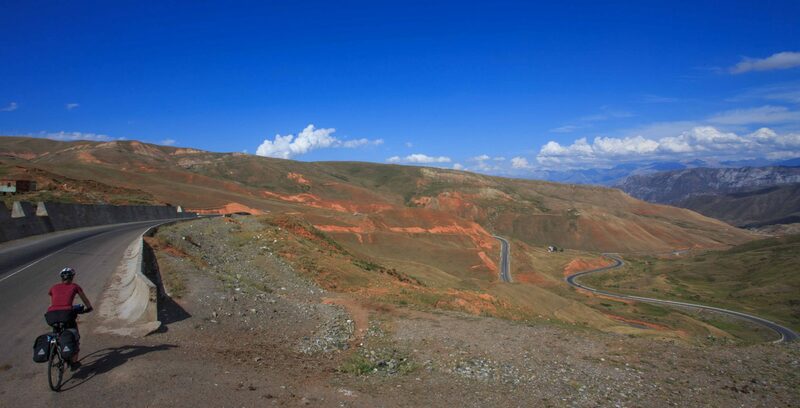 The road was good and traffic calmed shortly out of Osh at Bashbulak or Mady villages. The well surfaced tarmac made progress easy and we enjoyed the riding. Small children ran out at every village shouting “hello” then “bye bye” as we left, despite knowing how popular this route is we felt like the first foreign cyclists most had ever seen. We stopped for lunch at a table outside a small village store, the lady serving spoke good English and was a student in China back for summer. Somewhat out of place for the humble surroundings she was training in International Law for a career as a lawyer. After eating our bread and tomato we bought, she surprised us with plates of sweets, biscuits and fresh fruit all for free. It was the start of the incredible hospitality we would receive over the entire trip. After lunch the sun was still hot but we reached the first pass, it was only up to 2400m, however given a 900m starting point it was a decent warm up. At the top we first relaxed near the cheese and fermented milk selling yurts, before resting by a statue of some great old Mongul looking leader. It was here we saw the first wedding party arrive, an overheating stretched SUV pulled up, then 5 matching black jeeps arrived. 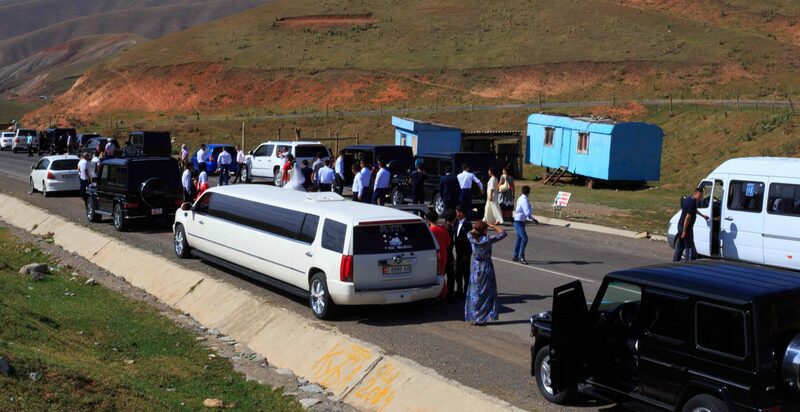 They totally blocked the road taking photos at the pass, and also allowing the limo to cool down a bit. Then the next party arrived, the bride in a Mercedes and the guests in matching white SUVs. It seems weddings are a big deal here! The descent off the pass surprised us, it was much steeper and longer than we had imagined. We lost a quick 800m to hit Gulcha far below us. We could have carried on but decided not to push it and stayed at a guesthouse in the town. We cruised the main street which had shops and a bank with ATM and we luckily stumbled upon a small yellow sign for a very friendly guest house. They spoke no English but held up signs in English asking questions with multiple choice answers. A simple but effective way to find out the cost, to order food and for what time we wanted breakfast! 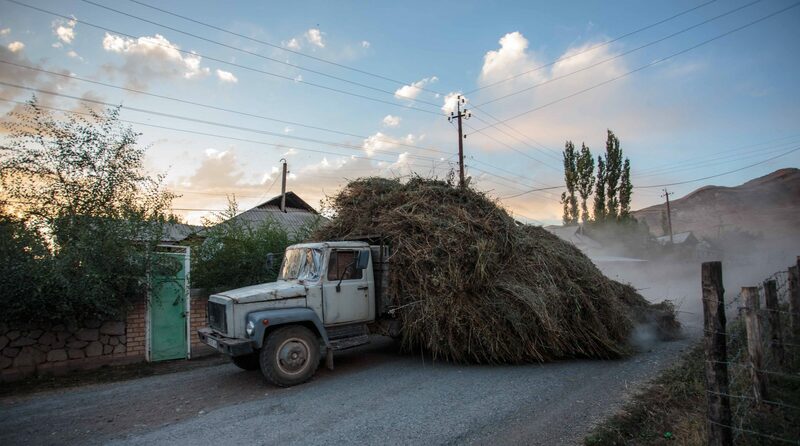 During our evening wander we saw in Gulcha they were busy overloading trucks and bringing the hay back to the village for winter storage. After a good nights sleep we were ready for a huge day two. 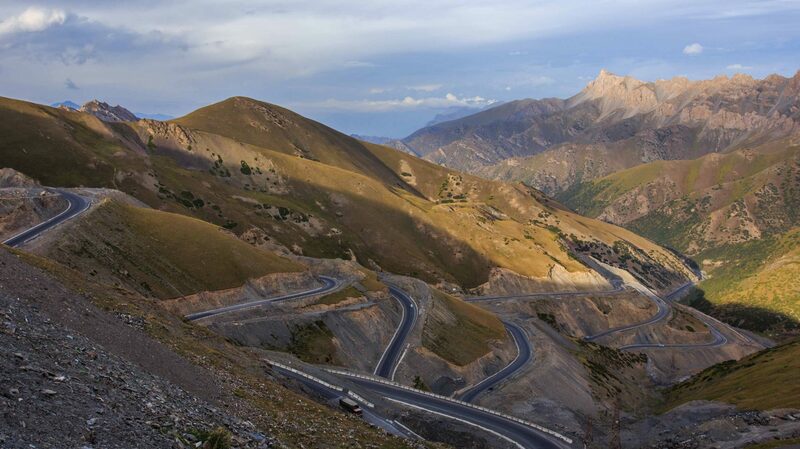 Only a bit over 100km but 3500m of climbing in total on roads that went up to 3600m. With no real acclimatisation to altitude of heat it was going to be tiring. The valley was beautiful, apricot trees contrasted the bare but colourful mountain geology of reds and oranges that surrounded us. We passed more herds of sheep, goat, horses and cows that blocked the entire road as they were herded along and down from high summer pastures. The herders tactic was to block the whole road so cars and trucks had to slow down and therefore reduce the risk of killing the livestock, much to the drivers horn honking displeasure. The road winded up and down as it followed the river valley southwards, the rock took on more amazing shades of red or orange as maybe these pictures illustrate. 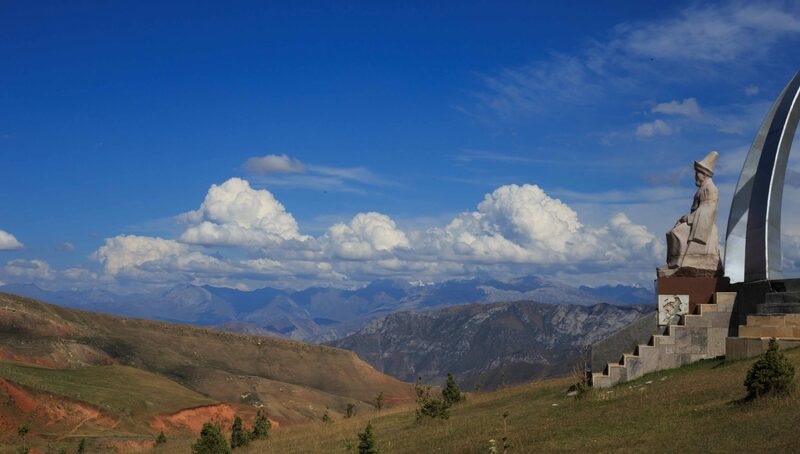 The mountains scenery from friendly villages to yurts and mountians was fascintaing all along the road. 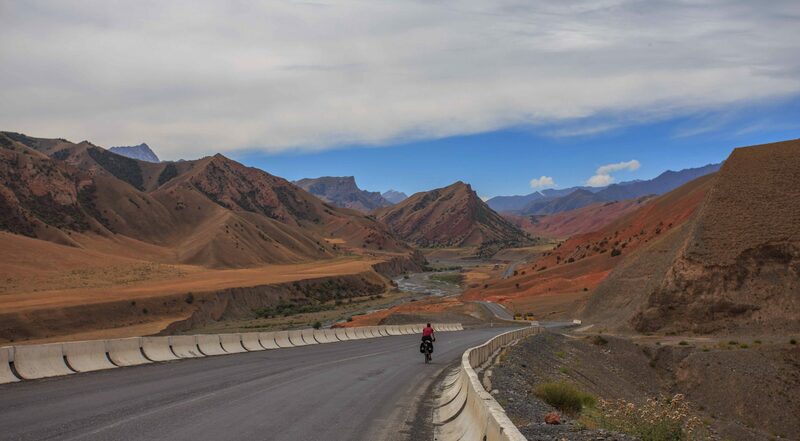 The final up was huge, we didn’t realise just how huge until the hairpins started and we attempted to climb from 2100m up to 3600m in the space of a few kms. At the end of the day the pass was not a welcome challenge and progressing up was incredibly hard. 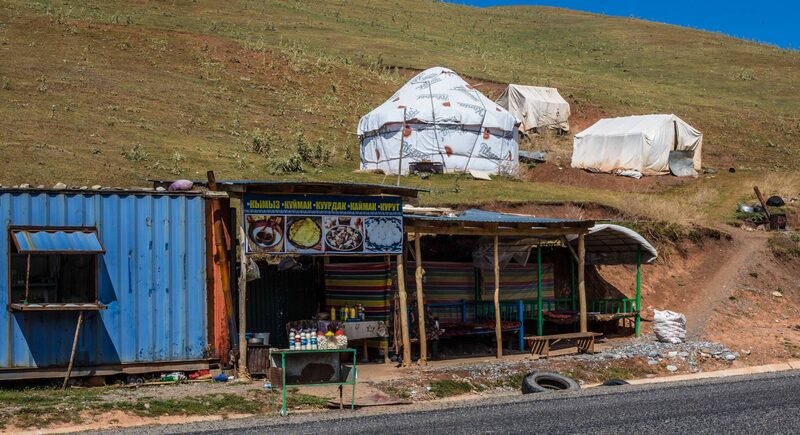 The end of the valley housed plenty of nomads yurts and caravans but nowhere jumped out as a good camp spot. The land was full of livestock, barking dogs and horse mounted kids. Taking each turn individually fueled by cheap Russian sweets, we progressed up the steep switchbacks. It was super slow progress and then the sun fell behind the mountains, creating a chill in the air. Finally we crested the top of the pass. 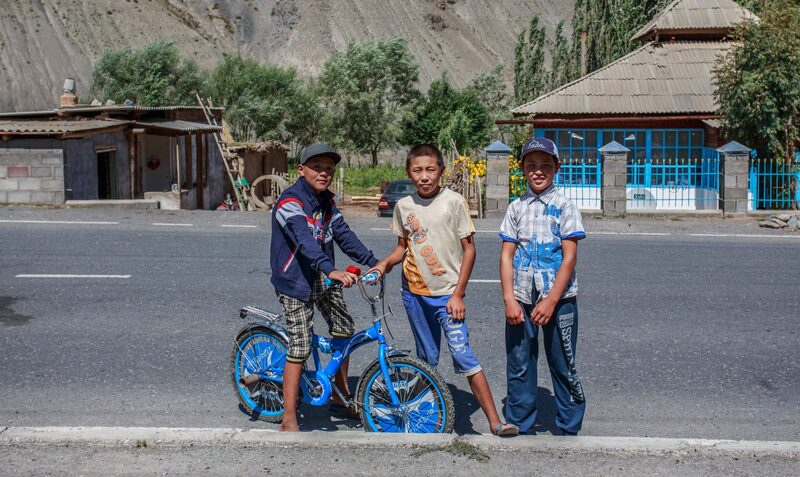 A few cars had stopped and a group of guys from Osh commended us on riding. They all wanted their pictures taken, well with Marion mainly. Then tagging along in the pictures were two friendly smiling but scruffy and somewhat feral kids who appeared from nowhere. I assume they must have a yurt nearby but they just wanted to see the bikes and stare at what was going on. They also wanted their pictures taken! Confident it was now all downhill to Sary Tash we set off jubilantly. Sadly looking at the map we had missed a second pass in our way. It was not as bad nor as high as the first but still a blow! It was a real struggle to the top as the evening shadows drew longer stretching out on the road in front of us as we struggled to pedal. Then finally we were flying downhill towards the village of Sary Tash. 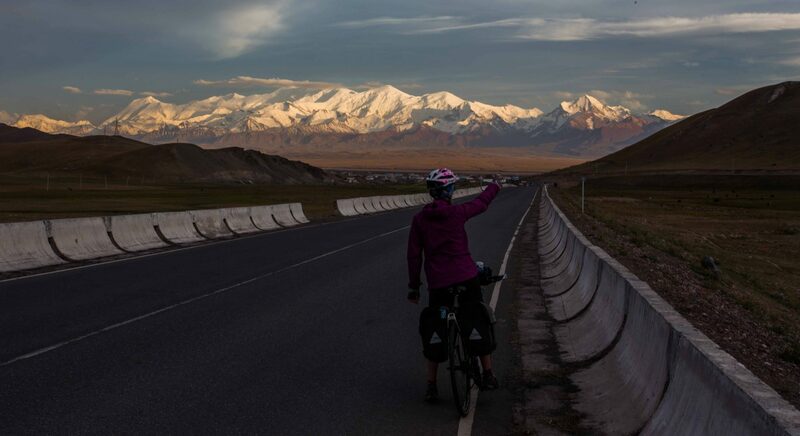 It was also then that the view of the Pamir mountains literally hit us forcing us to stop in awe. 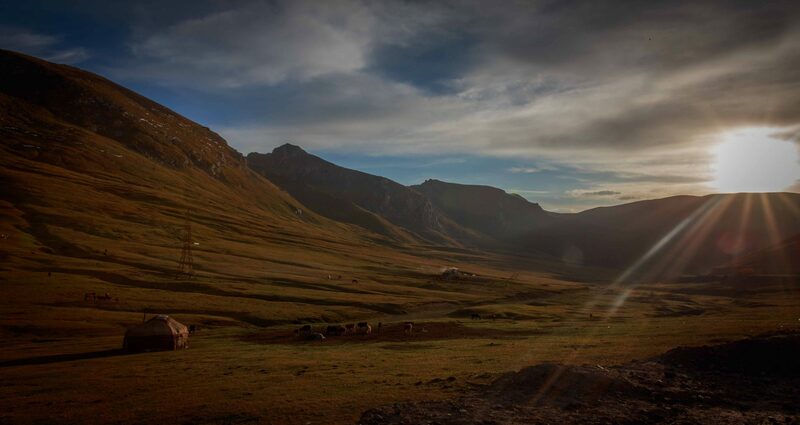 The white snow capped peaks including Peak Lenin at 7300m and possibly the 7500m peak communism, were cast in evening sunlight and their immense beauty rising from the steppe in front was a huge surprise. Talking of surprises Sary Tash was a surprise, I’ll explain why in the next blog!